Pearly-white chalk cliffs, lush beech forests and fine-sandy beaches—on the island of Ruegen, the Baltic Sea’s landscape shows its most beautiful face. 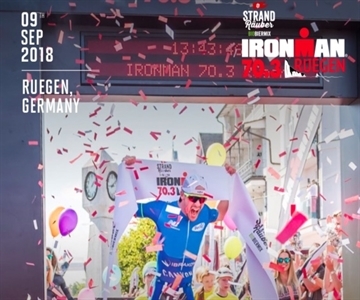 The pristine scenery, enchanting fishing villages, and the nostalgic architecture of Ruegen’s seaside resorts form a unique setting for athletic records. The swim part takes place in the Baltic sea, which is also known for its light swell which contributes its part to fast swim times. Because of the pear at the start of the race, spectators can overview the first 500 meters of the swim course easily. This guarantees goosebumps. Starting in Binz, the two-loop course leads northwards. With a total of 420 meters altitude difference, the course guarantees fast split times. The run course leads along the magical waterside promenade to the Schmachter Sea Promenade of the village Binz. Athletes pass the finish line two times before reaching the finish.